The village of Brymbo is no stranger to male voice choirs with a tradition of this beloved music - making stretching back over 100 years. 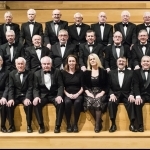 Brymbo Male Choir has enjoyed numerous incarnations, the present group originating in the late 1950’s. Local musician, Mr Glyn Hughes ALCM LLCM, was appointed Conductor in 1966, and the musical world opened up to the choir with subsequent performances throughout Great Britain, tours to America and Europe, television appearances and several audio recordings. After 46 years as Musical Director, Glyn Hughes retired from the choir, but not before receiving a well-deserved MBE for his services to music and charity. Glyn Hughes was succeeded as Musical Director by Dr David N. Evans FRSA in 2011. After retiring his position in 2015 David was followed into post by Mr Gareth F Hughes. The choir’s current Musical Director Ms Shirley Newman G.R.S.M.A.R.C.M. (Singing Dip) P.G.C.E. 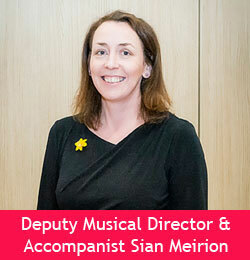 took over the baton in September 2016 to become the choir’s first female Musical Director and will lead the choir in the next chapter of its history. Get in touch via our Contact page to find out more.